Welcome to Campanile Toulouse Sud Labège Innopole, 3-star hotel! 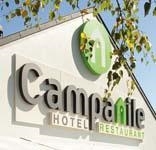 A few minutes south of Toulouse, you will be pleased to find your fully air-conditioned Hotel Campanile. Whether arriving from Blagnac airport, the station or the motorway, exit'ZI du Palais', you will be well placed for exploring the rest of the region.